Robert Fordyce Aickman (27 June 1914 – 26 February 1981) was an English writer and conservationist. As a conservationist, he is notable for co-founding the Inland Waterways Association, a group which has preserved from destruction and restored England's inland canal system. As a writer, he is best known for his supernatural fiction, which he described as "strange stories". The writer of his obituary in The Times, as quoted by Mike Ashley, said, "... his most outstanding and lasting achievement was as a writer of what he himself like to call 'strange tales.' He brought to these his immense knowledge of the occult, psychological insights and a richness of background and characterisation which rank his stories with those of M.R. James and Walter de la Mare." Ashley himself wrote: "Aickman's writings are an acquired taste like fine wines. I have no doubt that his work will always remain unknown to the majority of readers, and perhaps he would have wanted it that way. He wrote what and how he wanted, for expression, not for popularity. In another of his letters to me he said 'I have received a good deal of esteem, but never a big commercial success, and am usually wondering whether anything by me will ever be published again.' ... It is astonishing that someone of Aickman's stature should have difficulty in selling his work. Perhaps now, too late for Aickman's benefit, someone will have the sense to publish it." This situation has since been remedied by an extensive program of reprints of Aickman's work by Tartarus Press, Faber, and New York Review Books Classics. Aickman was born in London, England, the son of architect William Arthur Aickman and Mabel Violet Marsh. He attended Highgate School from January 1928 until July 1931. Mike Ashley reported that at the time he compiled his Who's Who in Horror and Fantasy Fiction, Aickman objected to the inclusion of his date of birth. Instead he said that the entry should read "Aickman, Robert. Man of Mystery". "That", he said, would be helpful. I should approve entirely." On his mother's side, Aickman was the grandson of the prolific Victorian novelist Richard Marsh (1857–1915), known for his occult thriller The Beetle (1897), a book as popular in its time as Bram Stoker's Dracula. He was involved in the famous investigation into the equally famous, haunted Borley Rectory. Another indication of his lifelong interest in the supernatural is his longstanding membership of the Society for Psychical Research and The Ghost Club. He remarked in a letter to Mike Ashley, "What impact such things have had on me, and the sources of my inspiration, are simply too much for a letter. If you wish to pursue such topics, I shall be pleased to have a talk." Unfortunately that talk never took place, but Ashley points out that Aickman's early life, including some supernatural episodes, will be found detailed in his autobiography, The Attempted Rescue (Gollancz, 1966). He originally received his training in architecture, the profession of his father. In the opening lines of his autobiographical work The Attempted Rescue (1966), Aickman described his father as "the oddest man I have ever known". Of Aickman's character, Elizabeth Jane Howard said in a 2011 interview at the Tartarus Press blog, that he "hated children" and of his childhood that "He told me about his childhood but I think he exaggerated that. I went to the house in Stanmore where he was brought up, and his mother did go and leave him, and that probably had a much worse effect than he realised on him. He was reading by the time he was four and he went to very good schools. Highgate was a very good school. I think it probably was a fairly lonely childhood. … He could be very prickly and difficult, or he could be very charming. He certainly had the gift of the gab." Aickman was married to literary agent and children's book author Edith Ray Gregorson (1914–1983) (known as 'Ray') from 1941 to 1957. She authored Lemuel (illustrated by Peter Scott, husband of Elizabeth Jane Howard, with whom Aickman had an affair) and Timothy Tramcar. He had been responsible for the general direction of the very successful Market Harborough Festival of Boats and Yachts, attended by more than 50,000 visitors. This was topped in 1962 when he directed the Waterborne concert with fireworks at the City of London Festival, with an audience of 100,000. 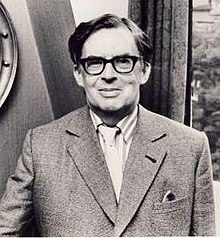 With a keen interest in the theatre, ballet, and music, Aickman also served as a chairman of the London Opera Society (1954–69) and was active in the London Opera Club, the Ballet Minerva, and the Mikron Theatre Company (a company which performs via touring the canal waterways of Britain). In the mid-1970s, Aickman lived in a flat in Willoughby House at The Barbican Estate. In 1977 he moved to a flat in Gledhow Gardens, Earls Court, where he lived until his death. Aickman was diagnosed with cancer in the winter of 1979. He refused to have conventional treatment and consulted a homeopath. He had planned to go to the States in the autumn of 1980, to receive a fantasy award, but he was too ill to travel, despite rallying in the summer. He died in the Royal Homeopathic Hospital Royal London Hospital for Integrated Medicine on 26 February 1981. His obituary appeared in The Times on 28 February. Later, there was a memorial concert at the Royal Society of Arts, at which various well-known people, including the naturalist Sir Peter Scott, paid tribute to him. In 2015 R.B. Russell and Rosalie Parker of Tartarus Press released a feature-length documentary on the life and work of Robert Aickman, which was premiered at the World Fantasy Convention. It includes interviews with friends of Robert Aickman, and the authors Reggie Oliver and Jeremy Dyson. It can now be seen on YouTube. 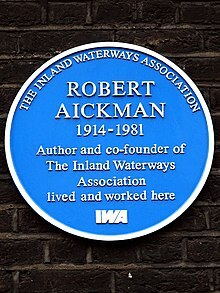 Aickman is probably best remembered for his co-founding of the Inland Waterways Association, a group devoted to restoring and preserving England's then-neglected and largely derelict inland canal system. The association was sparked off by a letter sent by Aickman to L. T. C. Rolt following the publication in 1944 of Rolt's highly successful book Narrow Boat, describing the declining and largely unknown world of the British canals. The inaugural meeting took place on 15 February 1946 in London, with Aickman as chairman and Rolt as honorary secretary. The IWA organized successful campaigns and attracted notable supporters, including as president the writer and parliamentarian Sir A. P. Herbert and as vice-president the naturalist Peter Scott. Scott's wife, Elizabeth Jane Howard, was part-time secretary, working in Aickman's flat in Gower Street; she had an affair with Aickman, which she describes in her autobiography Slipstream (Macmillan, 2002). Aickman began to have policy disagreements with Rolt. Aickman wanted to campaign to keep all of the waterways open, whereas Rolt had sympathies with the traditional canal workers and believed it necessary to prioritize which canals could be kept open. The disagreement became public: Aickman had organized the IWA's first boat rally and festival in August 1950 and attempted to prevent Rolt from attending and promoting his book The Inland Waterways of England; nevertheless, Rolt attended, as did his publisher, Philip Unwin. Aickman engineered a change to the rules to require all members to conform to agreed IWA principles, and in early 1951 Rolt and others were excluded from membership. Aickman published two nonfiction books on the waterways in 1955. Nevertheless, the IWA has been one of the most successful conservation organizations in British history, succeeding in restoring and reopening much of the original canal network. As a writer, Aickman is best known for the 48 "strange stories" which were published in eight volumes, one of them posthumous. The American collection Painted Devils consists of revised versions of stories which had previously appeared in other books. After three of his stories appeared in We Are for the Dark (1954), occasional short stories appeared in magazines and anthologies during the rest of the 1950s, but Aickman's involvement with his many societies kept him from any writing at length. The year 1964 thus came as a watershed, with a slightly mystical novel, The Late Breakfasters, a story collection (Dark Entries) and the first Fontana Book of Great Ghost Stories, which he edited for eight volumes. "Those, if any, who wish to know more about me", Aickman wrote in 1965, "should plunge beneath the frivolous surface of The Late Breakfasters." Opening as a comedy of manners, its playful seriousness slowly fades into an elegiac variation on the great Greek myth of thwarted love. His own subsequent collections were Powers of Darkness (1966), Sub Rosa (1968), Cold Hand in Mine (1976), Tales of Love and Death (1977) and Intrusions (1980). I believe in life after death, and I decline to particularize upon the meaning of the words, because of all futile and reductionist attempts at definition, this is the most idle. ... Most of my stories aim at universal themes, however difficult it may be to attain to them. Cold Hand in Mine and Painted Devils featured dust jacket drawings by acclaimed gothic illustrator Edward Gorey. August Derleth proposed that Arkham House should publish a book of Aickman's best stories, but was unable to meet the author's demands and withdrew the proposal. The original collections of short stories are quite scarce, though copies of the U.S. edition of Cold Hand in Mine are very plentiful. The Model: A Novel of the Fantastic (New York: Arbor House, 1987) was a novella which remained unpublished in his lifetime. Aickman had hoped to have the work illustrated by Edward Gorey. According to Mike Ashley, "Aickman bemoaned the lack of publisher interest in this work of about 35,000 words." Tartarus Press published a new collection of unpublished and uncollected fiction and non-fiction in 2015 as The Strangers and Other Writings. In 1975, Aickman received the World Fantasy Award for short fiction for his story "Pages from a Young Girl's Journal". This story had originally appeared in February 1973 in The Magazine of Fantasy & Science Fiction; it was reprinted in Cold Hand in Mine. The winning of this award pleased Aickman immensely, as at that time he considered it his best story. In 1981, the year of his death, Aickman was awarded the British Fantasy Award for his story "The Stains", which had first appeared in the anthology New Terrors (London: Pan, 1980), edited by Ramsey Campbell. It subsequently appeared posthumously in Night Voices. In 1968, a television adaptation of "Ringing the Changes", retitled "The Bells of Hell", appeared on the BBC 2 programme Late Night Horror. A radio play version based on "Ringing the Changes" was broadcast on the CBC Radiodrama series Nightfall on 31 October 1980. In 1987, HTV West produced a six-episode anthology series for television called Night Voices, of which four were based upon stories by Aickman: "The Hospice", "The Inner Room", "Hand In Glove" and "The Trains". A 1997 adaptation of "The Swords", directed by Tony Scott appeared as the first episode of the cable original horror anthology series The Hunger. Jeremy Dyson has adapted Aickman's work into drama in a number of forms. A musical staging of his short story "The Same Dog", for which Dyson co-wrote the libretto with Joby Talbot, premiered in 2000 at the Barbican Concert Hall. In 2000, with his League collaborator Mark Gatiss, Dyson adapted Aickman's short story "Ringing the Changes" into a BBC Radio Four radio play. This aired exactly twenty years after the CBC adaptation, on Halloween, 2000. Dyson also directed a 2002 short film based on Aickman's story "The Cicerones" with Gatiss as the principal actor. In addition to writing his own stories, Aickman edited the first eight volumes of the Fontana Book of Great Ghost Stories between 1964 and 1972. He was assisted in this by Christine Bernard, an editor at Collins. He selected six of his own stories for inclusion over the course of the series. The fourth and sixth volumes lack one of his tales. He also supplied an introduction for every volume except the sixth. Aickman's autobiographical writing consists of the two memoirsThe Attempted Rescue (London: Victor Gollancz, 1966) and The River Runs Uphill: A Story of Success and Failure (Burton-on-Trent: Pearson, 1986). In 2001, Tartarus Press reissued the former volume in a new edition with a foreword by the writer and Aickman enthusiast Jeremy Dyson of the British comedy quartet The League of Gentlemen. For a time, Aickman served as theatre critic for The Nineteenth Century and After. His reviews remain, to date, uncollected in book form. He also wrote two books relating to his conservation activities, Know Your Waterways and The Story of Our Inland Waterways (both 1955). Aickman produced a number of works that remain unpublished. These include the plays Allowance for Error, Duty and The Golden Round. A philosophical work entitled Panacea: The Synthesis of an Attitude runs to over 1,000 pages in manuscript form. Copies of these items are preserved, along with Aickman's manuscripts and other papers, in the Robert Aickman Collection at the British Library, with some papers deposited at Bowling Green State University, Ohio. I think that Aickman is one of those authors that you respond to on a very primal level. If you're a writer, it's a bit like being a stage magician. A stage magician produces coin, takes coin, demonstrates coin vanished... That tends to be what you do as a fiction writer, reading fiction. You'll go, "Oh look. He's setting that up. "...Reading Robert Aickman is like watching a magician work, and very often I'm not even sure what the trick was. All I know is that he did it beautifully. Yes, the key vanished, but I don't know if he was holding a key in the hand to begin with. I find myself admiring everything he does from an auctorial standpoint. And I love it as a reader. He will bring on atmosphere. He will construct these perfect, dark, doomed little stories, what he called "strange stories". His literary gifts were of an extremely high order. His prose style – supple, urbane, sophisticated, restrained, yet capable of surprisingly powerful emotive effects – never falters from the beginning to the end of his work. There are few writers who are as purely pleasurable to read, regardless of their subject matter or the success or failure of their actual work, as Robert Aickman. His major literary influences (it might be better to say analogues) appear to be M. R. James and Walter de la Mare, yet he excels the former in richness and variety of texture and the latter in the sustained intensity of all his literary work. From the first I understood that he was a deeply original artist. This in no way implies that I understood Aickman immediately because I didn't. Sometimes I would look up at the end of a story, feeling that the whole thing had just twisted itself inside out and turned into smoke - I had blinked, and missed it all. It took me a little while to learn to accept this experience as valuable in itself and to begin to see how the real oddness of most of Aickman's work is directly related to its psychological, even psychoanalytic, acuity. Unconscious forces move the stories itself, as well as the characters, and what initially looks like a distressing randomness of detail and event is its opposite - everything is necessary, everything is logical, but not at all in a linear way. To pull off this kind of dream-like associativeness, to pack it with the menace that results from a narrative deconstruction of the notion of "ordinary reality", to demonstrate again and again in excellent prose (no dumb experimentation or affectation here) that our lives are literally shaped by what we do not understand about ourselves, requires a talent that yokes together an uncommon literary sensitivity with a lush, almost tropical inventiveness. Robert Aickman has a gift for depicting the eerie areas of inner space, the churning storms and silent overcasts that engulf the minds of lonely and alienated people. He is a weatherman of the subconscious. The Late Breakfasters. London: Victor Gollancz, 1964. Library reprint: Bath: Cedric Chivers, 1978. Reprint: London: Faber Finds, 2014; Richmond, VA: Valancourt Books, 2016. The Model. New York: Arbor House, 1987. Reprint: London: Faber Finds, 2014. Note: Howard's stories here are collected, with an additional story, "Mr Wrong" in her Three Miles Up and Other Strange Stories (Tartarus Press, ISBN 1-872621-75-9). Dark Entries: Curious and Macabre Ghost Stories. London: Collins, 1964. Reprint: London: Faber, 2014. Powers of Darkness: Macabre Stories. London: Collins, 1966. "Your Tiny Hand Is Frozen"
Sub Rosa: Strange Tales. London: Victor Gollancz, 1968. "The Houses of the Russians"
"No Stronger than a Flower"
Cold Hand in Mine: Eight Strange Stories. London: Victor Gollancz, 1975. Reprint: Faber, 2014, with a new introduction, "Uneasy Does It: An Introduction to Robert Aickman" by Reece Shearsmith and a new afterword, "Memories of a Friend", by Jean Richardson. "The Real Road to the Church"
Tales of Love and Death. London: Victor Gollancz, 1977. Intrusions: Strange Tales. London: Victor Gollancz, 1980. "Mark Ingestre: The Customer's Tale"
"The Case of Wallingford’s Tiger"
The Wine-Dark Sea. New York: Arbor House/William Morrow, 1988. Reprint: London: Faber, 2014. The Unsettled Dust. London: Mandarin, 1990. Reprint: London: Faber, 2014. Know Your Waterways. London: Coram, 1955. The Attempted Rescue. London: Victor Gollancz 1966. The River Runs Uphill: A Story of Success and Failure. Burton on Trent: Pearson, 1986. R. Reginald (1979). "Robert Aickman". Science Fiction and Fantasy Literature, v. 2: Contemporary Science Fiction Authors II. 2. Gale Research Company. p. 791. ISBN 0-8103-1051-1. Briggs, Scott D. "Robert Aickman: Sojourns into the Unknown". Studies in Weird Fiction 12 (Spring 1993), pp. 7–12. ———. "The Poetics of the Unconscious: The 'Strange' Stories of Robert Aickman". Discovering Modern Horror Fiction II, ed. Darrell Schweitzer. Mercer Island, WA: Starmont House, 1988. Joshi, S. T. "So Little Is Definite". The Modern Weird Tale. Jefferson, NC: McFarland, 2001. Morris, Christine Pasanen. "The Female 'Outsider' in the Short Fiction of Robert Aickman". Nyctalops 18 (1983), pp. 55–58. Ricketts, Martin. "Enigma Macabre: An Evaluation of the Short Stories of Robert Aickman". Shadow 3:1 (Nov. 1972), pp. 4–9. Articles, essays and papers by other authors have appeared on the website Robert Aickman: An Appreciation, and in the journals Studies in Weird Fiction (published by Necronomicon Press), All Hallows (published by the Ghost Story Society), Studies in the Fantastic, Supernatural Tales and Wormwood. ^ abcdefgAshley, Mike. "In Memoriam: Robert Fordyce Aickman", Fantasy Newsletter (June 1981), p. 13. ^ Hughes, Patrick; Davies, Ian F. (eds.). Highgate School Register 1833–1964 (6th ed.). p. 265. ^"Jean Richardson. "Memories of a Friend", Afterword to Robert Aickman, Cold Hand in Mine, London: Faber, 2014, pp. 346-47. ^"Jean Richardson. "Memories of a Friend", Afterword to Robert Aickman, Cold Hand in Mine, London: Faber, 2014. ^ "Canals Campaigner Honoured in Central London". Retrieved 19 October 2016. ^A motion passed by the council in November 1950 reads "this council confirms that the policy of the Association is to advocate the restoration to good order and maintenance in good order of every navigable waterway by both commercial and pleasure traffic." Ian Mackersey (1984). Tom Rolt and the Cressy Years. London: M&M Baldwin. p. 87. ^ David Bolton (1990). Race against Time. Methuen. pp. 89–91. ^IMDb entry for "The Hospice"
^IMDb entry for "Hand in Glove"
^Crawford, Gary William. Robert Aickman: An Introduction. Gothic Press, 2003, p.71. ^S. T. Joshi, The Modern Weird Tale (Jefferson, NC: McFarland, 2001), p. 218. ^Quoted in Jim Rockhill, rev. of Akin to Poetry: Observations on Some Strange Tales of Robert Aickman by Philip Challinor (Baton Rouge: Gothic Press, 2010).